On today’s show we welcome M.C. Laubscher. M.C. is a wealth strategist, educator, and financial freedom fighter all the way from South Africa. He is the President and CEO of Valhalla Wealth Financial and the creator and host of the popular business and investing podcast, Cashflow Ninja. His mission is to help as many people as possible eliminate the that control banks and financial institutions have over their lives by building their wealth in a variety of ways, outside of Wall Street. 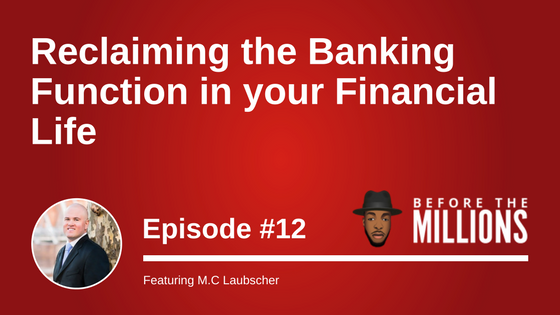 He does this by reclaiming the banking function in your own financial life through structuring an efficient cash flow management systems and creating and building assets that provide multiple streams of income. Valhalla Wealth Financial was built on the principles and values of self-ownership, self-reliance, independence, personal and financial freedom, and lifelong learning and financial education. In this episode we speak to M.C. about busting those financial myths and how to reclaim and reuse your money over and over again. M.C. tells us about his background growing up in South Africa and how he started working in real estate before he went into wealth and finance. The books M.C. read that helped him make that paradigm shift. How M.C. started looking at what money really is, and made the mindset shift. The strategies M.C used and how he implemented them to get started. Listen as M.C. explains the infinite banking concept and how you can incorporate it. Understand why M.C. started researching the way wealthy people handled their money. Discover more about the cashflow versus accumulation model. Why M.C believes that the 401(k) is an unproven system. How real estate income acts as a hedge against inflation. Learn how the accumulation model is going to fail people in the future. Find out how markets only do three things: go up, go down, or go sideways. Listen as M.C. explains why people following the cashflow model will be living golden days. Understand what real estate M.C. invested into. Discover how M.C wants to build a business that is location independent to help people from all over the world. Why M.C decided to get into the financial services industry. The biggest challenge M.C faced in starting and owning his own business. The reason why the most important real estate in the world is that piece of real estate in between your ears. Find out why M.C. started podcasting and how it helps him cater to his specific audience. How leadership platforms have contributed to M.C’s main business. The time in which M.C. had to overcome failures in his business, and how it played out. Discover how once you start putting out good solid content that provides value, you start to see growth and change in your business. Hear why you have to try to find a way to purchase things more effectively. M.C.’s favorite before the millions books to read. Listen as M.C. explains some sacrifices he had to make to get where he is today. Hear how M.C.’s family has been very supportive and a key to his success. How M.C. identifies the analysis paralysis that hold people back from being successful. This podcast was definitely worth listening to! I was left with solid and practical financial advice to create future wealth. I also enjoyed the financial literacy book recommendations given in the podcast. Overall great job and I cannot wait to soak up more knowledge in the episodes to come.